Article by Alison Wells © 25 July 2012. 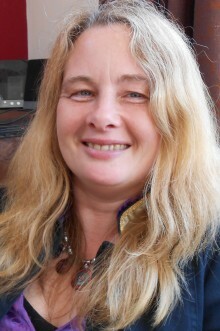 When Mary Vensel White uploaded her novel to the Authonomy site for writers she didn’t realise that within months it would be picked up to be published by Harper Collin’s. I chatted to Mary about her unique path to publication, her writing life, juggling writing as a busy mother of four and asked her to tell us more about her novel The Qualities of Wood. Hi Mary, tell us a bit about your background and situation. Hello, I’m a writer and mother of four and both jobs keep me entirely busy! We live in southern California, where it’s usually sunny and mild and difficult at times to stay inside and write. It’s a challenge, I know, but I try to muddle through. I studied literature in college and still read quite a bit, although now I restrain myself from writing awful essays about the books I read. Usually. We’re here to talk about your book The Qualities of Wood. This book was written over a period of several years, tell us about that and what the book is about. I recently heard another writer say when someone says it took fifteen years to write a book, it’s misleading because much of the time was probably NOT writing. This is certainly the case with The Qualities of Wood. I finished the first draft in a six-month period in the late 1990s and over the ensuing years, it has been edited many, many times. But, there was also a stretch of years during which I had my children and spent much time at the park with them, and nothing was done with the novel. Once my brain cells began to repair a few years ago, I retrieved my previous writings and began to work again. You’re a busy mother, how has your writing career developed alongside family life? It’s a work in progress! As all parents know, it’s a job without regular hours. My main current role seems to be as driver. The kids are in school during the day, but I spend afternoons and many evenings transporting them to various activities around town. Luckily, I have a spouse who is very active and available to them as well, so somehow, we usually get everything done. It’s difficult to find mental energy sometimes, but I’ve gotten particularly good at stealing swatches of time when I can. If I expected to have a solid two hours to answer these questions, for example, that would be unrealistic with the children home for summer. But if I can squeeze in a couple questions here and there throughout the day, it will eventually get done. It’s more difficult for the actual writing, where I really do need more focus. That gets done in the evenings or when the house is quiet during the day. How do you see your writing progressing in the future? I suppose I can only think in terms of the next project, although I would hope that over time, my writing will only improve. Inspiration strikes in surprising ways at unexpected times. I just finished a novel calledFortress for One and I thought all along I would next focus on a collection of stories I began some time ago. Then, out of the blue, another idea for a novel came and it’s becoming obvious to me that this will be the next focus. One of the exciting parts of writing for me is to think about working in different styles, thinking about form and structure and things like that. The new book will be a type of novel I haven’t attempted yet, and I’m excited about that. The route to publication of The Qualities of Wood is a fascinating story. Your novel came to the attention of HarperCollins through the authonomy site. Can you tell us about authonomy, your experience of it and how your book was chosen? Authonomy is a site sponsored by HarperCollins for unpublished writers. Anybody can post all or part of a writing project, or simply join the site to look for new things to read. Other members critique and rate the books and at the end of each month, the top five are sent for review by a HarperCollins editor. The entire experience was very rewarding for me, not only because my book was chosen to be the first published under HC’s new authonomy imprint, but because I made so many wonderful connections and improved my own editing skills in the process. What did it mean to you in your career to have been found and published through this venue? To have my book published has been a major boost and terribly exciting, and it has opened many doors. It’s very rewarding to find readers for your book, readers who like and appreciate your writing, and it’s even better when one of those readers is a publisher! To see the book out in the world—I suppose it’s like sending a child off to college. You feel that in some ways, you’ve done all you can do, given it a good home. Can you take us through the timeline of publication and the new experiences that came along with that? I posted my novel on authonomy in March of 2010. In January of 2011, it made the Editor’s Desk on the site and was sent for review, and in January of 2012 it was published. First, there was round of edits, larger things like plot, characterization, and the ending needed to be reworked. Then it’s off to a copyeditor to look for smaller things—grammar, word inconsistencies, things like that. 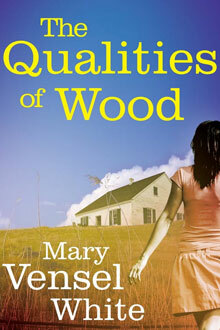 I have heard horror stories about other writers’ experiences, but my process with The Qualities of Wood was pleasurable. I always felt supported and consulted, and I was completely content with all the changes we decided, mutually, to make. Of course the surreal aspects of publishing—being sent the cover art, seeing your name at Amazon the first time, getting good reviews—were major highlights along the journey as well. Had you tried other avenues of publication before the authonomy site? What do you think authonomy can offer the aspiring author? What advice would you give to those thinking of uploading their work to the site? I tried all of the things aspiring writers try, I suppose. I attended a few writers’ conferences, sent out queries to agents and publishers, began to investigate self-publishing options. The authonomy community was such a positive experience for me because of the connections. Here was a place where everyone shared the same goal. I benefited from many, many helpful critiques of my book and by reading other manuscripts, my editing skills improved. The advice I would give to anyone considering joining this online community would probably pertain to just about any online community: keep your end goal in mind, be a positive force, avoid the drama that can occur. At authonomy, nothing will endear you more to the other writers than reading their work and offering thoughtful opinions. Sure, everyone would love to get that publishing deal but really, I think most of the writers would just like to have someone read their writing. Who would your book The Qualities of Wood appeal to? What sorts of themes and ideas are you drawn to in your writing? The Qualities of Wood is literary fiction, in that it’s character-driven, but the plot includes a mystery back story, so I’ve found many readers in the mystery crowd. Really, I think it can crossover to women’s fiction, mainstream fiction, even chick lit perhaps. As for themes and ideas, this is what usually begins a project for me. In the case of TQOW, I was thinking a lot about the ways that urban or natural settings can affect people. I was thinking about relationships, especially with parents and spouses, and I was thinking about what it means to grow up and find your place in the world. Also, about creating art and memory and how each practice is subjective. So just a few small ideas! What are you working on at present and have you decided what route you will take in submitting it for publication? My recently completed novel is titled “Fortress for One.” It’s about Gina, a middle-aged woman with an orderly life of routine. Over the course of a weekend, her life will be disrupted as she’s forced to re-evaluate her past, present and future. I’m just about to start editing the book again, after some helpful suggestions from readers, and I’m starting to think about what I’ll do with it. But I’m also still tinkering on that story collection, and the new novel breathes down my neck daily. Do you think that the publishing industry is more challenging these days? Or that sites like authonomy and the ease of self-publishing are working strongly in authors favour? Personally, I think it’s an exciting time for authors. I have a unique perspective on this because back in the late 1990s when I began writing, I had some interactions with publishers and agents and I remember thinking what a depressing time it was for fiction and how unlikely the chance for publication seemed. Although it’s not always a popular opinion, I believe that Oprah and her book club had a huge effect here in the U.S., and fiction is being read much, much more now. Couple that with the variety of ways a writer can publish now—both digitally and in print, traditional or self-publishing—really, it seems that we’re at a crossroads in publishing, where the situation for authors can only continue to improve. Have you any encouragement for advice for aspiring writers? A few things: read, continue to improve your skills, and stay true to your ideas rather than trying to follow rules. Secondly, put on your business hat and spend part of each day investigating your options, if publication is important to you. Make connections with other writers. Write something every day.